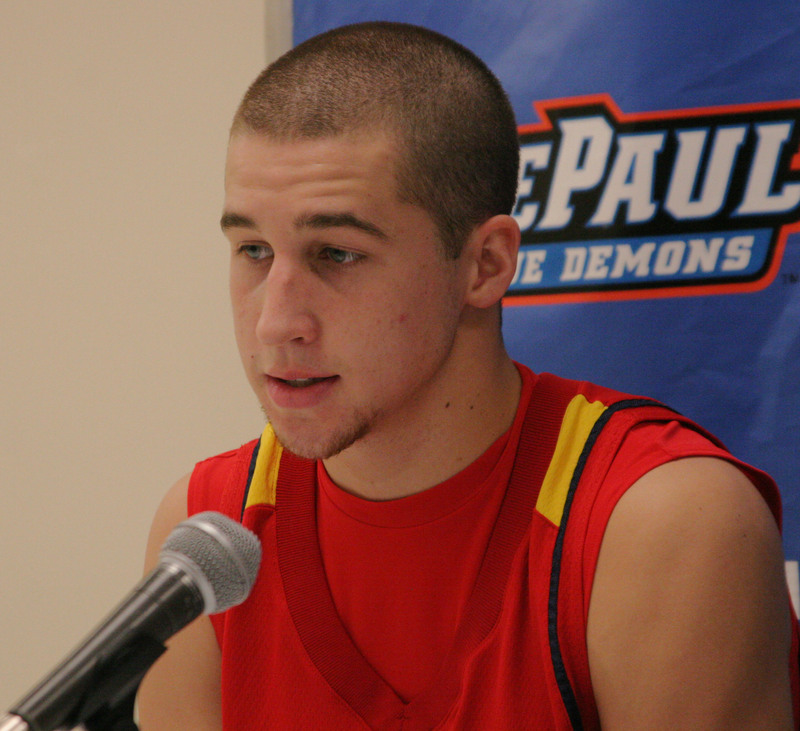 Scott VanderMeer had 13 points and 10 rebounds as part of a balanced UIC attack. Balanced scoring and an inside-outside offensive attack in the second half lifted UIC to a 75-65 victory over Detroit at the Pavilion on Saturday afternoon, handing the Titans their 12th straight defeat. The Flames (10-8, 4-3) survived a major scare from Detroit, the Horizon League’s last-place team, and their dynamic senior guard Jon Goode. Goode, the 5-foot-10 sparkplug from Flint, Mich., scored 20 first-half points and finished with 35, including a Pavilion-record-tying eight three-point baskets. Goode’s play lifted the Titans (4-14, 0-8) to an 11-point lead late in the first half, leaving the Flames searching for answers. 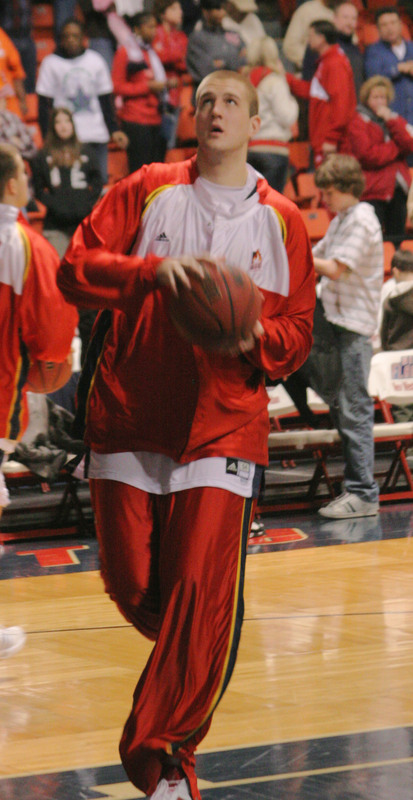 However, the 7-foot VanderMeer was a big part of the Flames’ comeback, posting the majority of his 13-point, 10-rebound, three-assist effort in the second half. The big man was not alone as five Flames scored in double figures, led by 17 points apiece from senior Robert Bush and freshman Robert Kreps. Detroit led 39-28 after a free throw by Goode with 3:22 left in the first half, but the Flames scored the final five points of the first half, capped by a Kreps’ three-pointer to close within 39-33. The Titans kept UIC’s offense off-balance in the opening half by using a full-court trap. UIC’s top two scorers of late, Josh Mayo and Karl White Jr., were both kept off the score sheet in the first 20 minutes. Bush was the one player that kept UIC close, nailing four three-pointers and scoring 12 first-half points. The Flames heated up after a halftime pep talk, going on an 11-2 run to start the second half, which included two three-pointers from Mayo. UIC took a 44-41 lead on a layup by VanderMeer. Detroit countered with the next nine points for a 50-44 advantage, but VanderMeer went back to work, scoring two consecutive close-in buckets to get UIC back into contention. Kreps hit a 10-foot runner to put the Flames back ahead at 55-53 with 7:20 remaining to set up a series of six lead changes over the next 2:28. Jon Goode hit eight three-pointers to keep the Titans close. Goode hit his seventh three-pointer of the game to put the Titans back on top at 62-61 with 5:08 to play. Kreps hit two free throws to give UIC the lead back at 63-62, kick-starting a game-clinching 12-0 spurt. With UIC up 66-62, VanderMeer made a steal, ran the floor and a finished off a beautiful 2-on-1 break by feeding Tori Boyd for a dunk. Bush hit a floater with 1:05 to push the lead to nine, effectively finishing off the tired Titans. Goode started the game with 10 quick points, including two threes, as Detroit opened a 13-5 lead. UIC wiped away that deficit thanks to Bush, who hit his fourth three-pointer of the first half to cut the Titans’ lead to 19-17 with 10:22 before halftime. Boyd hit a three of his own to give Flames the lead. UIC’s Robert Bush nailed a season-best five three-pointers. Detroit took charge with a 20-6 spurt, taking advantage of the Flames’ struggling defense. Goode, Woody Payne and Zach Everingham each had six points in the spurt. UIC was better on defense in the second half, and in turn, executed better on offense. 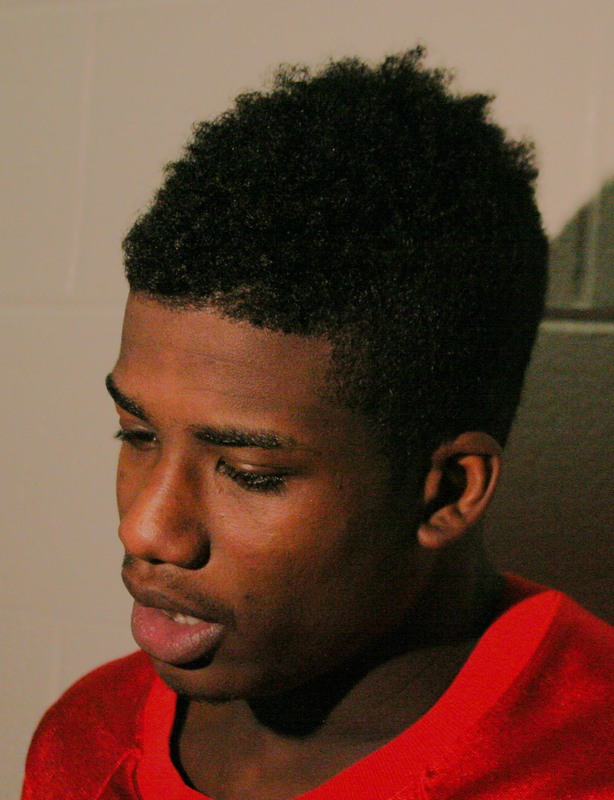 The Flames shot 52 percent after halftime compared to 31 percent for Detroit. UIC outscored the Titans 42-26 in the second period, including 14-0 from the foul line. The Flames had 17 assists on 22 baskets, including a career-best seven helpers from Kreps off the bench. Collins was disappointed with his team’s defensive effort, giving the Flames something to work on before their critical two-game stretch in Indiana with Valparaiso and Butler. Robert Kreps (pictured) and fellow freshman Tori Boyd combined for 29 points against Detroit on Saturday. Bush’s five three-point baskets were a career-high. 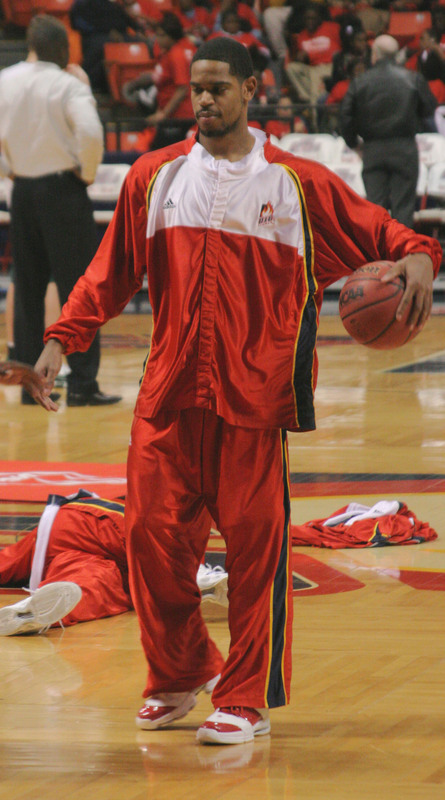 Here are a few photos from Saturday as UIC’s Hall of Fame class of 2008 was honored at the game. Also, the mascot basketball game took place at halftime. 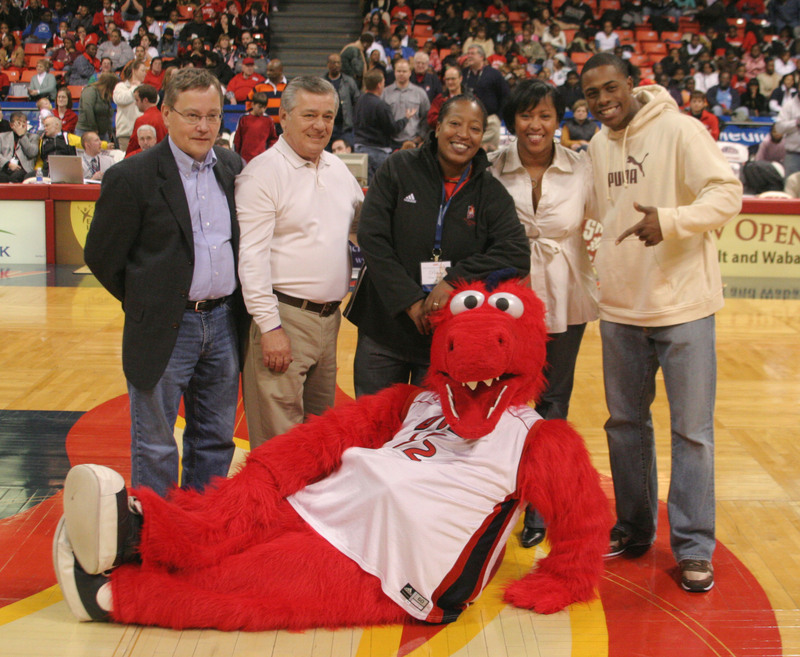 New UIC Hall of Famers (from left) Roger Wojtkiewicz (gymnastics), Ron Christopher (baseball), Penny Armstrong (basketball), Liz Crowder (track and field) and Curtis Granderson (baseball) pose with Sparky D. Dragon. 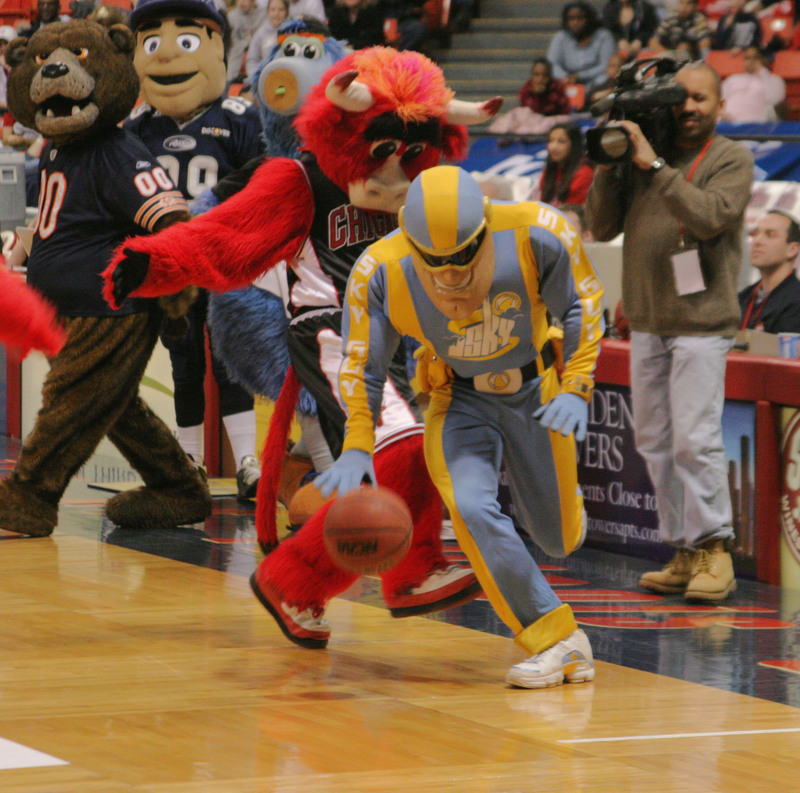 During the halftime mascot basketball game, Sky Guy dribbles past Benny the Bull as Staley (Bears), Grabowski (Rush) and Jammer (Joliet JackHammers) look on. 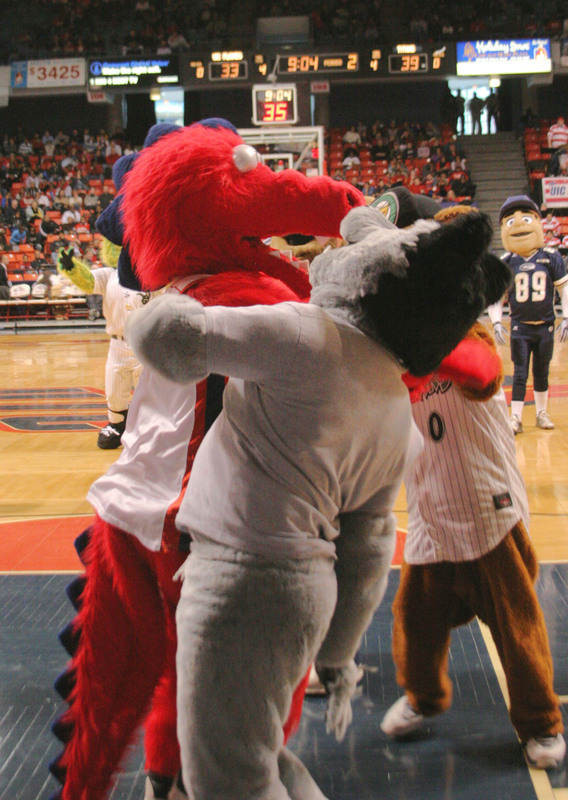 ”Referee” Sparky D. Dragon roughs it up with Loyola’s LU Wolf during the mascot game. 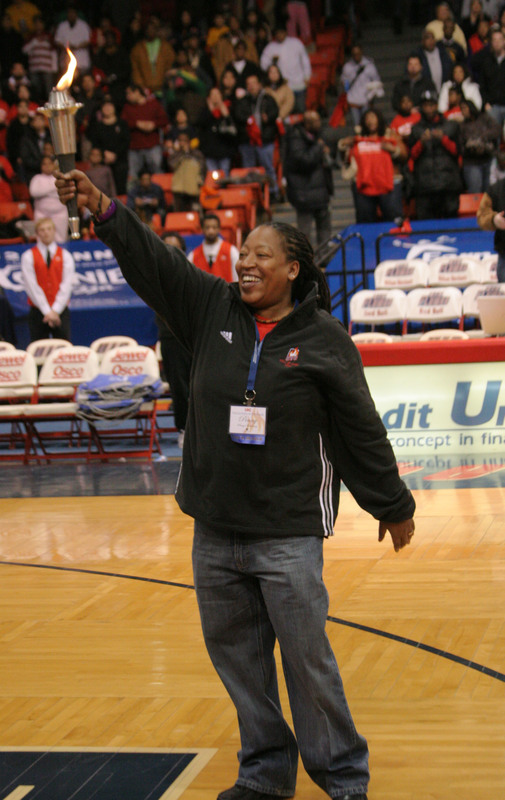 Legendary women’s basketball player Penny Armstrong holds the torch during UIC’s “Lighting of the Flame” ceremony.